Ensuring that your ducting fits the application properly and is in good working order should be a priority on every job site. For both new set ups and replacing old, worn out ducting is easy with standard and custom options by Air Systems International. With both standard ducting and conductive ducting available in multiple sizes, you can get up and running in top shape, in no time. 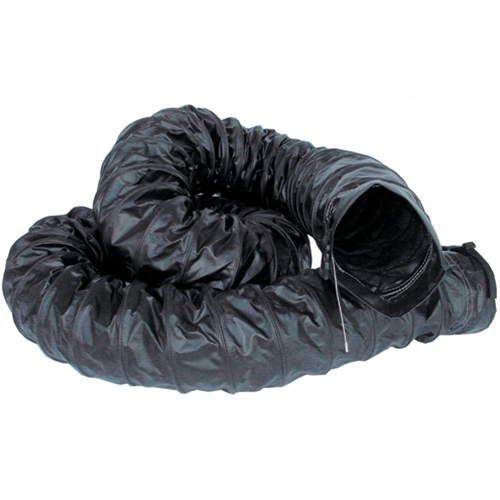 The SVH – CND25 black conductive ducting is 25 feet in length and with an 8 foot diameter. Featuring external wear strips and an internal steel reinforcing wire hoop (5 inch pitch). Attachment cuffs are at both ends of the hose (6 inch with 8 3/8 inch diameter) as well as adjustable belt straps. Grounding wires are installed at each end of the wire helix, and the ducting itself is rated for up to 180 degrees (F). Accessories and transition pieces can also be added to your order, to either reduce or enlarge the transition. Accommodate all transition sizes with ease and affordability, and ensure that proper connections allow for your breathing air system to function as intended. Additional solutions for ducting include storage canisters, connector pieces and more. Browse our online store or give us a call if you can’t locate the specific item you need. Air Systems International provides both standard and conductive ducting in several sizes, as well as offers completely custom orders. As a manufacturer, Air Systems is able to accommodate the most unique and challenging set ups with ease. For custom orders, accessories and more – give us a call today! Shop Air Systems International and other industry leading PPE equipment online at Intech Equipment and Supply. Our experts are available to assist you in comparison, planning and more – with extensive manufacturer resources coupled with our industry knowledge, you get the best of both worlds and can shop online from your home or office.